Have you ever woken up with back aches and joint pains? This may be due to the kind of mattress you have. The right mattress can definitely help you get a good night’s sleep and feeling well rested; while sleeping on the wrong mattress will only cause back pain and sleeplessness. For people who are suffering from chronic back pain, the wrong mattress will only make the pain worse than it is. If you are suffering from chronic back pains, the right mattress for back pain relief are those that can provide proper support for your spine in all the vital areas. Chronic back pain is usually caused directly by a wrong mattress, or a previously occurring back injury becomes more swollen due to sleeping on the wrong mattress. For this reason, you have to find a mattress that can support your spine in its natural curves and can relieve the pressure on any bony areas. You have to understand that a firm and supportive mattress is best, especially for the bony and muscular structure of the back. This will help maintain the proper alignment of the spine. The main reason why it is crucial to find the best mattress is because you spend about a third of your life sleeping on it. The thought that a firm mattress can help relieve or prevent chronic back pain is not always true; however, choosing a mattress that is neither too hard nor too soft according to your preference is the best way to go. A mattress that is too soft or too hard will only put more stress on the lower back structures of your body. Here are some tips for relieving back pain and successful mattress selection. Selecting the right bed. When choosing a bed, you have to realize that it is not only about the mattress. You must also have an excellent bed foundation. If you try putting a new mattress for your lower back pain on a worn-out bed spring, it won’t be a smart idea. It is better to look for a mattress with a matching foundation or box spring. Mattress support and comfort. As mentioned earlier, a mattress that can relieve back pain must be able to provide proper support for the heaviest parts of your body where your natural curves are located. Some of the main areas to consider are your head, shoulders, and hips. In addition, a mattress must also be comfortable. For instance, sleeping on a mattress that is too firm can lead to back pains, or aches on pressure points. Medium-firm mattresses may be more comfortable for those suffering from back pains because it allows the shoulders and hips to sink in slightly into the mattress. Furthermore, if you want a firmer mattress for more back support, you can get a mattress with thicker padding since this will offer better comfort. The three types of mattresses that are considered effective for back pains are: memory foam mattress, latex mattresses, and adjustable air mattresses. Space. When you are choosing a bed mattress, you have to consider the size of the mattress. For instance, if you are sharing a mattress with someone else, you may need a larger bed, such as a queen- or king-sized mattress. This will allow you to have enough space to move around. Know when to buy a new mattress. If you start waking up with back pains, your current mattress may no longer able to support you. You have to remember that your spine must never sink into your mattress to avoid back pains. For this reason, you have to observe your current mattress, and if it cannot provide you the same support and comfort as it once did, it is time to buy a new one. The best mattress for your chronic back pain is one that can support the normal curves of your back. The right mattress type for back pain won’t put stress on the important areas of your back while sleeping. Lastly, you also need to remember to try out the mattress before buying it. When you get sick or when you need medical attention, you immediately turn to your physicians. You trust them with your very lives, and you have utmost confidence that they will be able to treat your ailments. Since doctors have studied, trained, and continue to study and train in their respective fields, you believe that they know everything and that they can easily heal diseases. But doctors are also just mortals. They are also just people who aren’t perfect. So, physicians could, and many actually do, make mistakes. But the thing here is that when a doctor does something incorrectly, the results are often quite devastating. If you do become a victim of a hospital or doctor error, you should get in touch with a medical malpractice lawyer. Surgeons are actually great hospital heroes. They can cut patients open and fix things inside them. Then, they just sew them up to recover. Most of the time, procedures go well, with patients fully recovering from typical surgical procedures. However, surgeons also make mistakes; and one of the biggest mistakes a surgeon could do is leaving souvenirs inside you. If you think that jokes about forceps or gauze pads being left inside a surgery patient are not true, think again. Many patients have actually sued doctors for leaving small instruments inside their bodies. There are even some doctors who overlook 13-inch retractors in patients. It must be all that blood, right? Hospitals want to avoid these mishaps, which is why they have scrub nurses counting everything that’s being used in surgery, from small gauze pads to huge medical instruments. You might have heard of hospital horror stories wherein doctors amputate or cut the wrong body parts. Seems like urban legends, huh? Well, not exactly. These things actually happen. For instance, there are true tales about diabetic patients coming in the hospital to have their infected legs cut to prevent gangrene. But they come out of the OR with their infected legs still on and their good legs gone. Horrific. If you are into psycho-horror movies, then, surely, you must’ve seen movies where people being operated on by crazy psychotic killers wake up in the middle of being cut open because little to no anesthesia was used. Such a cringe-worthy scene couldn’t really happen in a modern hospital, right? Well, it actually could. This is what’s known as “anesthesia awareness”, wherein a patient wakes up in the middle of a procedure, but is unable to move, much less cry out. Who’s to blame? The person most likely to be blamed here is the anesthesiologist. But everyone in the surgical team must also take proper care of their patients. Also, it could really help if they have apt monitoring devices, like the bispectral index, in order for them to gauge a patient’s level of consciousness. This is so petrifying in so many levels. Imagine yourself being admitted for, say, a somewhat serious case of food poisoning; and then you leave the hospital with a new heart. What?! Seems so far-fetched – but it could happen. There have been cases wherein patients have undergone open heart surgery or other invasive procedures even though they did not need these. Why? Because the doctor or the medical team was negligent, that’s why. So, in case you are in a hospital for some minor case, make sure that you get to know the nurses in your floor. Also, always ask questions about things that are being done to you. They may find you irksome, but you’re only looking out for your welfare. Knowing how best to deal with bleeding in first aid situation is vital. Any form of blood loss can – of not addressed – lead to further complications (and even in the worst cases, death). That sounds intimidating but, in fact, there are some very simple procedures to follow to control bleeding. It may seem beyond obvious, but the first thing to do with any bleed is stem the flow of blood. Obviously, the level of blood loss differs depending on how severe the accident is. But the principle remains the same: stop the flow and you will make it easier for the blood to start clotting and get the healing process underway. Here’s a rundown of the main ways you can do this. 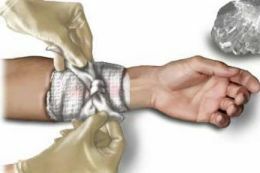 In life-threatening cases, you may have to apply a tourniquet – a tight knot around the affected area designed to stop the flow of blood completely. This is an emergency measure (for example, in the case of amputations) and not recommended for less severe bleeds. Of course, as well stopping the flow of blood and stabilising the victim, you may need to seek further medical attention – essential if the wound or bleeding is heavy to severe. Bear in mind too, that blood loss can lead to shock, so it’s important to act quickly and look out for possible signs of shock including: low pulse rate, feeling faint, weak or nauseous, dizziness and cold and clammy skin. So please remember that stopping bleeding can really help save lives and having the correct first aid kit is essential. Stay safe out there and take care!